Unique and totally different for an exhibition trade stand attraction, a trade show idea or Promotional event. 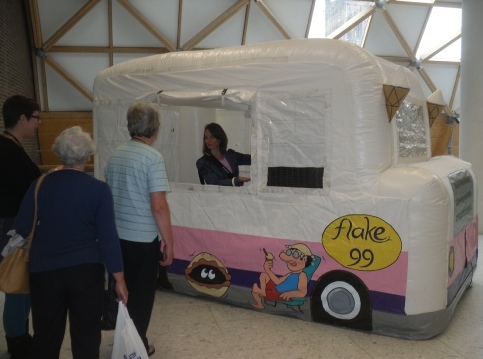 An inflatable ice cream van that can be taken almost anywhere! It comes rolled up and is inflated in under 1 minute. There are illuminated ice cream cones on the front (which are better seen in a darker environment) + original ice cream chimes with a choice of 64 tunes to chose from. 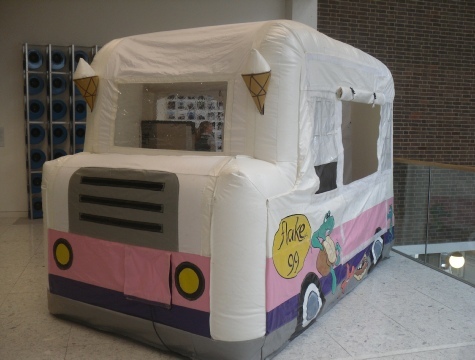 Electric supply is needed to inflate this indoor ice cream van. Inside you can fit a Mr Whippy soft ice cream machine, a large freezer and a table for consumables. On the sides are clear pockets for either ice cream names or promotion items, leaflets and give-aways. Power required: 240 volts, 800 watts 4 amps. Area required: 2000mm Length, 3600mm Width, 2300mm Height. Front top: 1100mm x 330mm/870mm. Rear top: 1600mm x 1800mm. Side top: 2220mm x 250mm. Side front window 600mm x 800mm. Side rear window 550mm x 800mm. Near side lower half (below window) 1500mm x 600mm. Alexandra Palace, Business Design Centre, Bournemouth International Centre, Donington Exhibition Centre Donington Park, Earls Court, Epsom Downs Racecourse ExCeL, G-Mex Centre, Hilton Brighton Metropole Hotel, Manchester Central Convention Complex, Novotel London West, National Exhibition Centre, Old Billingsgate, Olympia, Queen Elizabeth II Conference Centre, Ricoh Arena, The Royal Armouries Museum, Sandown Park Exhibition and Conference Centre, Stoneleigh Park, Telford International Centre, The O2 Arena, The Brighton Centre, Cardiff International Arena. Windsor Beaumont, Europe, UK. Expo. International, Ascot Racecourse, Windsor Racecourse.